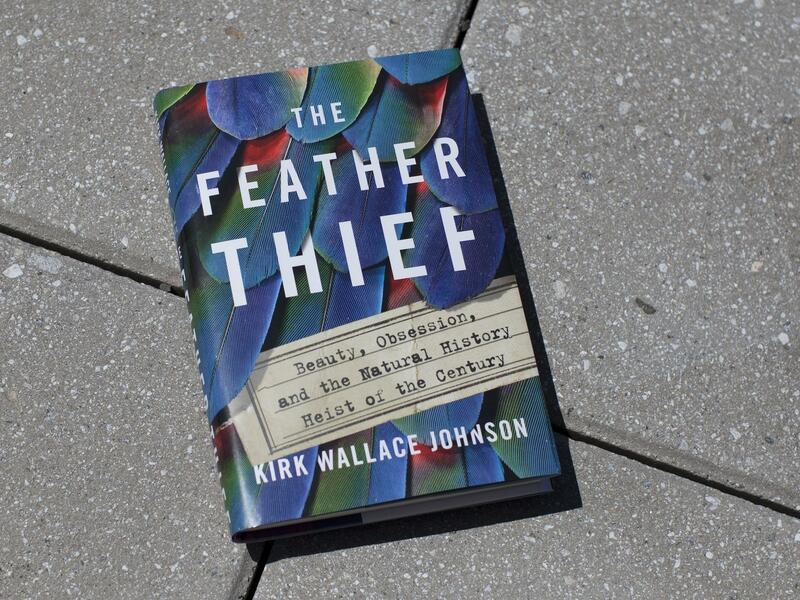 By the end of Kirk Wallace Johnson's absorbing book, The Feather Thief, we readers learn more than we probably ever wanted to know about feathers. But, we may also come to understand why it's important, ecologically speaking, to care about what happened to the feathers of what Johnson calls, "the missing birds of Tring." In his prologue, Johnson tells us that he stumbled on this mystery one day while standing waist-high in the Red River of New Mexico. Suffering from PTSD as a consequence of years of aid work in Iraq, Johnson had taken up the meditative sport of fly-fishing. On this fateful trip, Johnson's guide began telling him about his own hobby of Victorian salmon fly-tying. The ornate flies, the guide explained, were more of an art form than a fishing tool; they're composed of the iridescent jewel-toned feathers plucked from many of the rarest birds in the world, like the Indian crow and the king bird of paradise. Then, the guide went on to tell Johnson the bizarre story of a master fly-tier named Edwin Rist. In 2009, Rist — who was then a 20-year-old American student at the Royal Academy of Music in London — broke into the Tring Museum, a suburban outpost of the British Natural History Museum that was established during the Blitz. Once inside, Rist stuffed hundreds of rare bird skins into a suitcase he'd brought along. Many of those birds bore tags identifying that they'd been collected 150 years earlier by a naturalist named Alfred Russel Wallace, who was a colleague of Charles Darwin. It took over a year for British police detectives to trace the theft to Rist and by then he'd made a fortune online, illegally selling the bird skins or bags of assorted feathers to salmon fly-tying devotees. Of the 299 bird skins Rist had stolen, only 174 were found in his apartment still intact; out of those, only 102 specimens retained their labels. Without their labels identifying exactly where the birds had been captured, the specimens were no longer of scientific value. If the missing birds couldn't recovered, it would be an even bigger blow to the scientific record. Though it's non-fiction, The Feather Thief contains many of the elements of a classic thriller: We have, for instance, those exotic missing bird skins, that, like the Maltese falcon of yore, seem to have vanished into thin air; we have eccentric suspects — those rabid salmon fly-tiers, some of whom don't ask too many questions about the source of those endangered bird feathers for sale on the Internet. And, we have an obsessive amateur detective in Johnson who finds his double in Rist, the feather-obsessed criminal. All of this makes for compelling reading; but Johnson's quest to find the missing bird skins is motivated by more than just curiosity. I realized the preservation of these birds represented an optimistic vision of humanity: a multigenerational chain of curators had shielded [those specimens] from insects, sunlight, German bombers, fire, and theft, ... [Those curators] understood that the birds held answers to questions that hadn't yet even been asked. I won't tell you how Johnson's gallant search for the missing birds ends. But it's depressing to learn, as we do early on in this book, that Edwin Rist, the feather thief, never served any time in prison. In the eyes of the law, perhaps all those old feathers didn't amount to much. This is FRESH AIR. Our book critic, Maureen Corrigan, says that a new book called "The Feather Thief," about the underground world of exotic feathers, does for plumes what the 1998 book "The Orchid Thief" did for orchids. Namely, it will make readers curious to know more about a world they probably never knew existed. Here's her review. MAUREEN CORRIGAN, BYLINE: This is one weird but true story. It's a story that leads readers from 19th century scientific expeditions into the jungles of Malaysia to the feather fever of the turn of the last century, when women's hats were beplumed with ostriches and egrets. And it's a story that focuses on the feather-dependent Victorian art of salmon fly tying and its present-day practitioners, many of whom lurk online in something called the feather underground. By the end of Kirk Wallace Johnson's absorbing book "The Feather Thief," we readers learn more than we probably ever wanted to know about feathers. But we may also come to understand why it's important, ecologically speaking, to care about what happened to the feathers of what Johnson calls the missing birds of Tring. In his prologue, Johnson tells us that he stumbled on this mystery one day while standing waist-high in the Red River of New Mexico. Suffering from PTSD as a consequence of years of aid work in Iraq, Johnson had taken up the meditative sport of fly fishing. On this fateful trip, Johnson's guide began telling him about his own hobby of Victorian salmon fly tying. The ornate flies, the guide explained, were more of an art form than a fishing tool. They're composed of the iridescent, jewel-toned feathers plucked from many of the rarest birds in the world like the Indian crow and the king bird-of-paradise. Then the guide went on to tell Johnson the bizarre story of a master fly tier named Edwin Rist. In 2009, Rist, who was then a 20-year-old American student at the Royal Academy of Music in London, broke into the Tring Museum, a suburban outpost of the British Museum of Natural History that was established during the Blitz. Once inside, Rist stuffed hundreds of rare bird skins into a suitcase he'd brought along. Many of those birds bore tags identifying that they'd been collected 150 years earlier by a colleague of Darwin's, a naturalist named Alfred Russel Wallace. It took over a year for British police detectives to trace the theft to Rist. And by then, he'd made a fortune online, illegally selling the bird skins or bags of assorted feathers to salmon fly tying devotees. Of the 299 birds skins Rist had stolen, only 174 were found in his apartment still intact. Out of those, only 102 specimens retained their labels. Without their labels identifying exactly where the birds had been captured, the specimens were no longer of scientific value. If the missing birds couldn't be recovered, it would be an even bigger blow to the scientific record. Though it's nonfiction, "The Feather Thief" contains many of the elements of a classic thriller. We have, for instance, those exotic missing bird skins that, like "The Maltese Falcon" of yore, seem to have vanished into thin air. We have eccentric suspects - those rabid salmon fly tires, some of whom don't ask too many questions about the source of those endangered bird feathers for sale on the Internet. And we have an obsessive amateur detective in Johnson who finds his double in Rist, the feather-obsessed criminal. All of this makes for compelling reading. But Johnson's quest to find the missing bird skins is motivated by more than just curiosity. It turns out that what started off for him as an escape from the strains of refugee aid work became a mission to alert readers to the vulnerability of natural history collections, like the Tring, that may hold answers to the problems of extinction and climate change. These days, scientists can study those bird specimens to learn about rising mercury levels and other changes in the ocean and atmosphere. As Johnson says of the now-incomplete Tring collection, I realize the preservation of these birds represented an optimistic vision of humanity. A multigenerational chain of curators had shielded those specimens from insects, sunlight, German bombers, fire and theft. Those curators understood that the birds held answers to questions that hadn't yet even been asked. I won't tell you how Johnson's gallant search for the missing birds ends. But it's depressing to learn, as we do early on in this book, that Edwin Rist, the feather thief, never served any time in prison. In the eyes of the law, perhaps all those old feathers didn't amount to much. GROSS: Maureen Corrigan teaches literature at Georgetown University. She reviewed "The Feather Thief," by Kirk Wallace Johnson. Tomorrow on FRESH AIR, my guest will be comic Michelle Wolf. We'll talk about her performance Saturday night at the White House Correspondents dinner, which became controversial because of jokes like this one about Sarah Sanders. MICHELLE WOLF: I actually really like Sarah. I think she's very resourceful. Like, she burns facts. And then she uses that ash to create a perfect smokey eye. (SOUNDBITE OF EHUD ASHERIE'S "GYPSY BLUES") Transcript provided by NPR, Copyright NPR.